Photo of the Week. 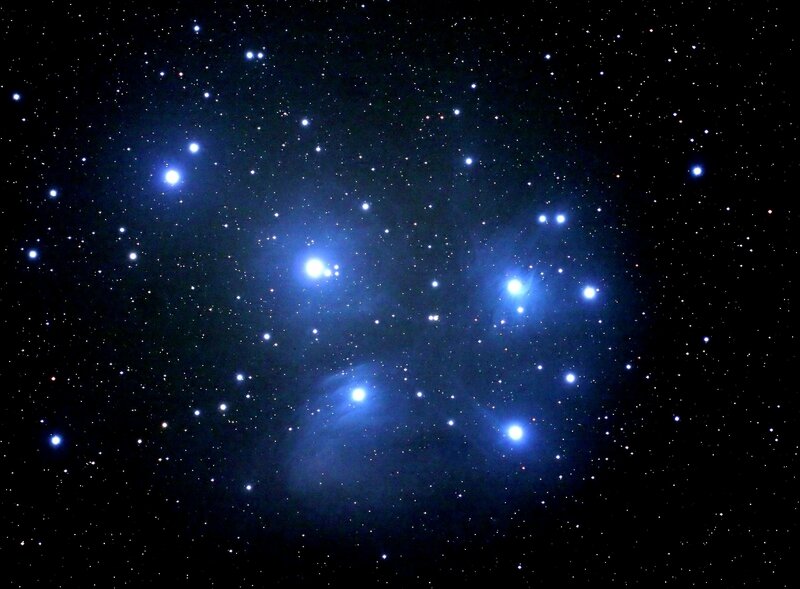 A magnificent new picture of Taurus's Pleiades (the blue "Seven Sisters") beautifully reveals myriad fainter stars and the soft surrounding dust cloud through which the cluster is passing. See it at full resolution. Courtesy of Mark Killion. Astronomy news for the week starting Friday, December 8, 2006. The Moon starts us off in its waning gibbous phase as it heads toward its third quarter on the morning of Tuesday, December 12, in daylight while descending western skies. During the remainder of the week it will wane in its crescent phase. The night of Saturday the 9th, the waning gibbous will rise in Leo just above (to the west of) Saturn, with the Moon, Saturn, and Leo's Regulus all in a fine row. By dawn the morning of Sunday the 10th, the Moon will have moved due north of the planet. Keep distance in perspective, however, the Moon a quarter million miles away, Saturn over 800 million. By the time of Moonrise the night of the Sunday the 10th, the three will still be in a line, but the Moon will have shifted to the other side of Regulus and will rise last. A day after last quarter, the Moon will pass perigee, where it is closest to the Earth. The morning Friday the 15th, the Moon will have made it into Virgo, and will pass south of Spica. As Mercury descends the early morning sky, Mars and Jupiter advance upward. A clear eastern dawn horizon and binoculars will show the three all bunched together early in the week, the trio rising about 6 AM. On the morning of Sunday the 10th, Mercury will pass just a tenth of a degree north of Jupiter, while the next day, Jupiter and Mars come together, Jupiter to the north of the red planet. Jupiter is by far the brightest, Mercury next, Mars the faintest of the three. While Mercury sinks out of sight, the other two will climb higher in dawn, with Jupiter leading. Back into evening, Saturn is making a serious impact by rising a little after 9:30, slowly moving retrograde to the west of Regulus. Venus will not be visible until the end of the month. The Geminid meteor shower (the meteors seeming to come out of Gemini) makes an appearance this week The shower spans roughly December 7 to 17, and peaks the morning of Thursday the 14th. The shower -- the debris of Comet (once thought asteroid) Phaeton -- typically delivers over one meteor a minute in a dark sky, which we will not have, the Moon washing out the numerous fainter ones. Passing high in the sky in early evening for northerners is Cassiopeia, the famed "W" outlining the throne of the ancient Queen. In almost the same relative position, those in the temperate southern hemisphere see the modern, dimmer, exotic constellation of Tucana, the celestial Toucan. To the east of it lies Hydrus, the Water Snake, while to the west one finds another bird, Pavo, the Peacock.